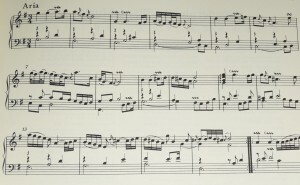 Probably, Sebastian Bach took up the composition of his fourth book of keyboard exercises, known as “Aria with Variations” (BWV 988), by the end of the 1730s or beginning of 1740. It was published in 1741, when Bach was 56 years old. The denomination of “aria” (”air” in English) is not the same as the “aria” in opera. For Sebastian Bach “aria” meant “melody”. In the case of this particular work, that melody is geared in a ternary rhythm of sarabande, a dance of Spanish origin (zarabanda, in Spanish), but it was popularized and introduced in Europe through the French court of king Louis XIV. Thus, this work, whose main theme I reproduce below on a video, is dance, melody and air at the same time.